Pawtucket wasted opportunities in game two, as they were downed by the Bisons in seven innings, 3-2. Jeremy Kehrt took the loss, allowing three runs on two walks and six hits, one of which was a two-run home run. The Pawtucket offense was carried by RBI from Bryce Brentz and Alex Hassan. The PawSox came up short in the end, as they stranded five runners on base in the final two frames. The Portland Sea Dogs scored early and often as they downed the New Britain Rock Cats (MIN), 6-1. Mike Augliera earned the win, allowing no runs on three hits and two walks in his six innings of work. Mookie Betts kicked things off as he motored home from first on Shannon Wilkerson's first-inning RBI double. The Sea Dogs would score again in the inning off of a Travis Shaw single. Stefan Welch and Henry Ramos also picked up RBI in the contest. Just as he opened scoring, Betts also closed it, launching a solo shot in the top of the ninth to put Portland up by five. The Salem Red Sox rode a strong start from Justin Haley to a 2-0 victory over the Winston-Salem Dash (CHW). Haley notched his first win of the season, spinning six innings of four-hit baseball and walking only one. Kyle Stroup pitched the ninth, pitching around two walks and a single to earn the save. David Chester drove in both of Salem's runs, one in the fourth and another in the ninth. Chester had one of four Salem hits on the night, as the other were picked up by Matty Johnson, Jonathan Roof and Kevin Heller. Johnson and Roof each took free passes on the night as well. The Greenville Drive had their contest against the Savannah Sand Gnats (NYM) suspended in the sixth inning. At that point, the two clubs had been tied 3-3. The game has been rescheduled to be completed in Savannah on May 14. The Sand Gnats got to Drive starter Mario Alcantara early, tagging him for three runs on five hits and five walks in three innings of work. Myles Smith came on in relief and pitched two innings of two-hit baseball. Wendell Rijo and Jake Romanski were each 2 for 3 as Greenville collected nine hits in this rain shortened contest. Player of the Night: Mookie Betts notched his second, Double-A four-hit game, earning himself POTN honors. 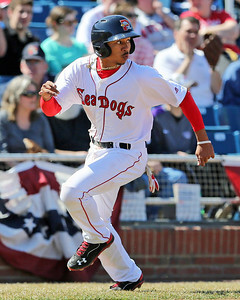 The speedy Betts launched his second home run this season in the ninth to seal the game for the Sea Dogs. Betts has reached base safely now in 43 straight games, dating back to August 2 of last season. The 21-year-old now boasts a .453/.492/.717 triple slash line on the season.